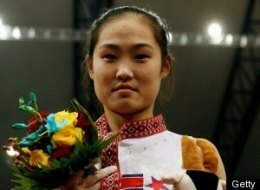 The FIG has issued a 2 year suspension to gymnast Hong Su Jong and the Democratic People’s Republic of Korea National Federation (PRK) for a period of 2 years, from October 6, 2010 to October 5, 2012. The FIG Presidential Commission confirms the proposal made by the Disciplinary Commission to suspend gymnast HONG Su Jong and the Democratic People’s Republic of Korea National Federation for a period of 2 years, from October 6, 2010 to October 5, 2012, and to forbid from participating in any capacity in any competition or activity authorised or organised by the FIG, any Union, any National Federation, any club or in any international event (incl. national for the gymnast), and to sanction the PRK National Federation to pay a fine of CHF 20’000. Wow!! The FIG have come down hard and rightly so. PRK can appeal the decision in writing to the FIG Appeal Tribunal within 21 days of notification of the decision. Great move by the FIG. What do you think? Too harsh? Leave a comment below or discuss on the Full Twist Facebook page. I think it’s a fair ruling but I feel for the up and coming gymnasts who have been working for years to compete at a high international level who might have made the 2012 Olympics, this isn’t their fault but where do FIG draw the line? It’s a harsh punishment , I’m not sure what else could have been done. I feel there’s a huge double standard… I mean why was China not banned for two years for EXACTLY the same issue. It’s not the first time North Korea is banned for the very same reason, but I agree with Katrina, there are obvious double standards here. And by the way, in the case of China, it’s their Federation the one that should have been punished as in this case and not the gymnasts that earned the bronze medal at Sydney.